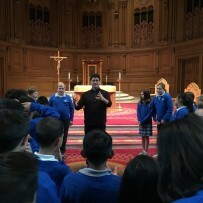 Our 5th grade class recently had the opportunity to visit St. Patrick’s Seminary in Menlo Park. They toured the seminary and campus, celebrated Mass with Fr. Bud Stevens, Rector of the Seminary, and had lunch with the seminarians. It is a beautiful campus, steeped in history! Our students had a great time!